I've scoured the forum archives and elsewhere and it's interesting to me how little seems to be known about Santo considering that his tone is so recognizable and unique. The only video footage I can find of him are two blurry television performances, possibly mimed, of Sleepwalk from 1959. Other than what is widespread of their early history, there's relatively nothing about his post-Sleepwalk career. There's vague info that he moved to Italy to lead a "bohemian" lifestyle, but continued to record on small labels. There was some confusion about his death but it seems that was actually concerning a relative with the same name. Now, it seems Johnny might be guilty of identity theft and re-writing history by omission. What's the deal? There are so many great recordings of his unique playing yet he's more or less a complete unknown after Sleepwalk. I've been trying to approximate his sound but there's so little info other that what type of steels he played.....a Custom and a Stringmaster, the differences of which apparently didn't have a significant effect on his tone. If anything, his buzzy cutting tone is more apparent on later recordings. I have some speculations to add to what's already out there. I think he must have used a very lightweight bar. On some tracks, his vibrato and the the way he enters and exits the notes are too speedy for a typical heavy steel bar. More to support that speculation is the similarity in tone of Hindustani steel players. I have a CD called "Bollywood Steel Guitar" which includes many tracks that could have been recorded by Santo. Not just the buzzing tone, but the quick phrasing style and vibrato. Find any videos of Indian players, and they are using very lightweight slides. Sometimes it's a brass bar with a diameter not much bigger than a pencil. I've even seen a small smooth river rock being used on a veena which gave a slightly abrasive stinging tone. At times, it sounds like he may have used something like a "sitar" bar. I grabbed the biggest allen wrench I could fine, about 10mm or 3/8", and used the flat to get the closest to Santo tone of anything I'v tried yet. Does anyone have any idea what type of bar he used? Video clearly shows him using a normal steel bullet type bar. As far as weight and length, good luck. You may look at vintage bars from the late '50s to get an idea of the standard bar of the time. As to his tone, I am convinced that "the sound" I think of when I think Santo and Johnny is the sound of his custom with the trap string through pickups. It has that top end sizzle and timbre. Later pictures show him with a Stringmaster, and like a lot of players he could probably sound like Santo on any steel guitar. But if I were looking to get close to that classic Sleepwalk sound gear-wise I would go for a Dual or Custom. I don't know what amp he used. And what about the info that he switched to a Stringmaster not long after Sleep Walk and still had that same biting tone, sometimes even more pronounced? Like I said, some artists, the really good ones, will sound like themselves on just about any guitar. But I have heard enough people play Sleepwalk on different guitars to know that sound when I hear it, and I contend that while Stringmasters are fine too, the most direct route for getting "that sound" for the rest of us is with a Dual or Custom, something with a short scale and string though trapezoid pickups. ok, well, I thought I might be onto something with what I'm hearing on the Bollywood soundtracks. There are quite a few different artists playing steel on the recordings and they all have a biting tone. Does anyone else here similarities to Santo here? It's a real case for CSI: Steel Guitar Edition when you try to do forensic analysis of a steel guitar sound from almost 60 years ago. You need to consider: the guitar, the pickups, the picks, bar, the amp, room, the mics used, the engineer's equipment and whether the studio had a plate reverb in the floor. And, beyond those questions, whether the sound coming out of your computer speakers is an accurate representation of the sound of the performance as realized on a 331/3 LP record played through a fine H-Fi system - which was the target for the player, engineers and producers involved. There's also the philosophical question: "who and what were their influences?" at a time in America when life was simpler and no one was bombarded by the entire history of human music - available via a few keystrokes. Santo had an attack to the note and a number of different vibrato signatures. 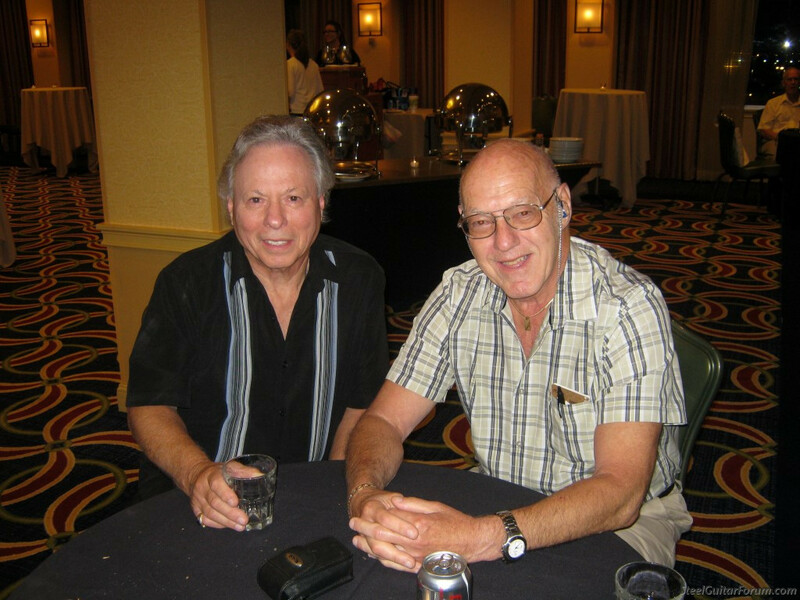 If you search Jody Carver's name, I believe he had some old posts where he spoke about hearing Santo and Johnny live. There is certainly a visceral quality to his early work that hits you in the gut and overshadows the playing of many who were more technically advanced on the instrument. He's always memorable and his music still connects with listeners today. A lot of us have been trying to solve the Sleep Walk puzzle for years. I think the sound we hear is the result of a combination of things. The Player is the most important ingredient IMO... Santo's staccato style of picking, fast vibrato, and his sparse, single note, single string style. Then there's the gear... a 1950s Fender Twin tube amp, no reverb. And a Fender steel guitar with trapezoid pickups. And the studio certainly had a tube console in 1959. Then there's the mix. The backing instruments are understated and the steel guitar is right out front. Another thing that I've read, and this is seldom mentioned... the recording is in the key of C#, but according to legend, the brothers played it in C and the producer had the engineer speed up the tape slightly. If you watch the live versions, Johnny is playing guitar in the key of C. If the tape was sped up, Santo's vibrato would sound slightly faster than he actually played it. The increased speed might make the playing sound more "energetic" and exciting. Or maybe not... it's food for thought! Edit: after posting this I see that Andy posted something very similar just before me. What Andy,Scott and Doug said, especially about the guitar amp and studio. I notice He plays most of the treble notes far up the neck, and his bass note walk, close to the pickup, probably to keep the bass notes " tight . But definitely take in to account his right hand position for certain notes. An interesting note, is he seems to be reaching behind the pickup quite a bit during sustained notes?? Not sure if he is muting overtones , but it is interesting to watch. I have often scouted through the topic "Post your version of Sleepwalk" and there are some lovely versions there. I never have recorded it but if I do I would go for the original note for note. Those notes, tone and use of slide make it all for me. So simple. Over the past couple of days I have had a Santo and Johnny bug and hunted out my old Jedson 6 string lap steel (Fender copy)to give them all a go. Re: Santo reaching behind the pickups . .
Good eye, Todd. It looks to me like he's cranking the tone knob for the highest note of the harmonics lick. Perhaps to keep the volume level with the rest? Speaking as one who was around in that day and saw the live telecast and owned the record. I hear nothing unusual except his tecnnique. The equipment sounds just like the Fender Dual Custom and amps of the day. No plate reverbs or other electronic effects. I actually recently acquired a Custom Triple neck and I can attest that this steel has a markedly different tone than my Single 8-string stringmaster (Can't recall the exact term for these). It's more nasal mid-rangey and definitely has a more pronounced "steel" sound. I think it's as the previous poster mentioned, the trapezoidal pickups with the string through the pickup that really alters the tone. I typically like the high end more rolled off on my stringmaster, but if I turn the treble up it doesn't get anywhere near the Custom sound. Just a different beast altogether. I was somewhat heartbroken to find out that the top pickup was almost completely silent and in bad need of a re-wind. However I was elated when Fralin Pickups directed me to Tom Brantley and he said he'd done scores of them. Doesn't hurt Geddy Lee promoted him 3 times in his new bass book either! IMO Santo's tone is had by a) using a Pro with a trapezoid pickup and b) picking near the middle of the string for that 'hollow' tone. You have to chase the middle, since it moves when you slide around, of course. Wouldn’t John Farina know all this stuff? 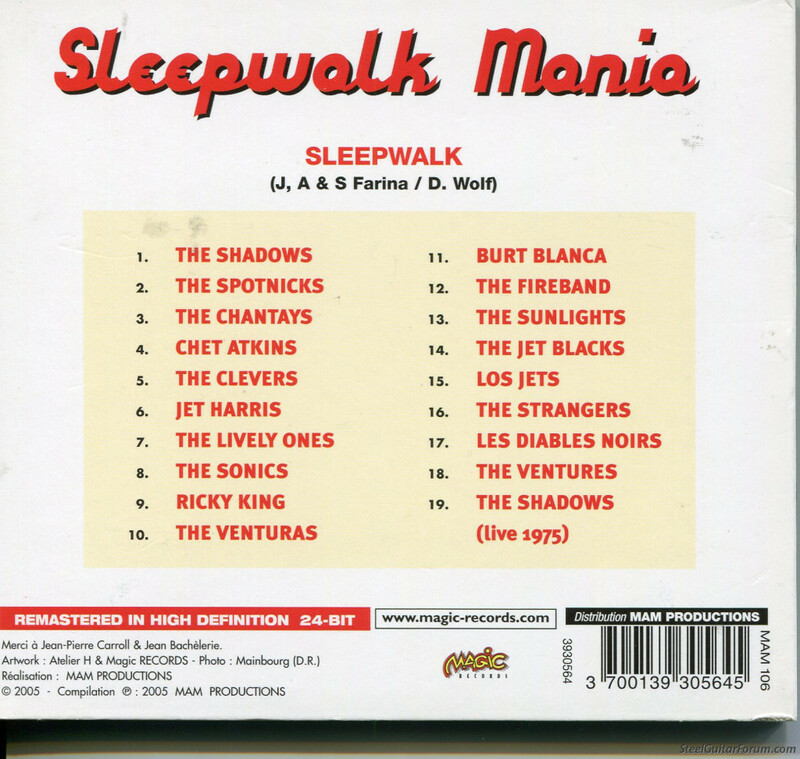 I saw somewhere that it's the 60th year since "Sleepwalk" was issued, if so a big congratulation goes to Johnny Farina. He's a very nice and cordial musician. 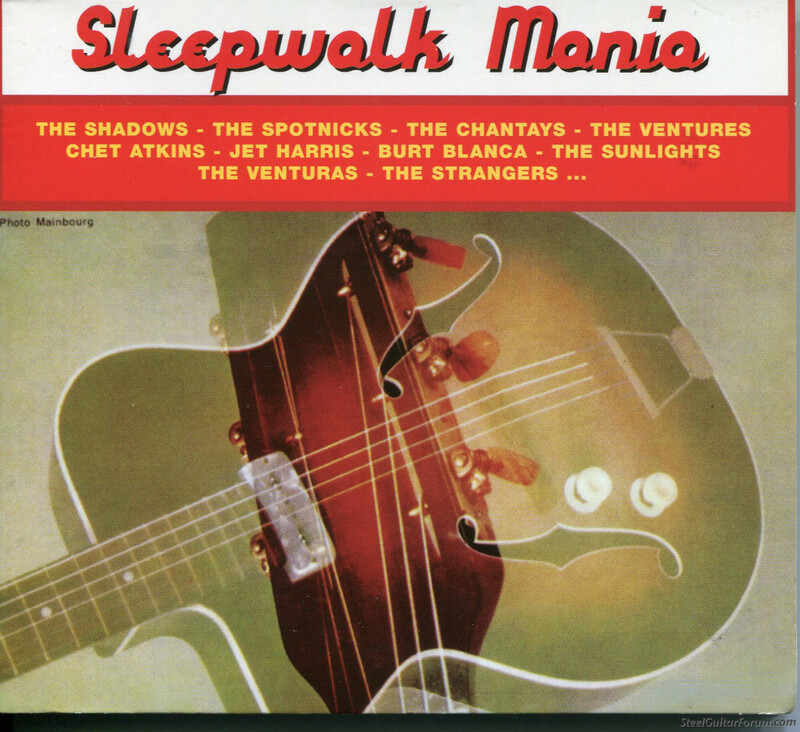 If young "slide" musicians of today remember anything about steel guitar, it's "Sleepwalk". At 81, I've been asked to play it by young folk. I don't know how many, if any folks are familiar with the attached CD. It was just a "cheapie" probably at Wal-Mart 4 or 5 years ago.